Finding a job is not as easy as it used to be. You have to decide what kind of job you want or what industry you want to work in, make a list of nearby places you’d like to work at, find out if your ideal choices are even hiring, and after all of that, you have to actually land the job, which is an entirely different kind of struggle. The whole process can be frustrating, disappointing, and terribly time-consuming, but you gotta’ do what you gotta’ do, right? Not exactly. With modern-day job sites, you can save yourself loads of time and aggravation by conducting your job search online. Feeling skeptical of online job boards? Statistics show that more than 18 million individuals find a job online every year. We can’t exactly help you charm your way through the interview, but we can help you get there. 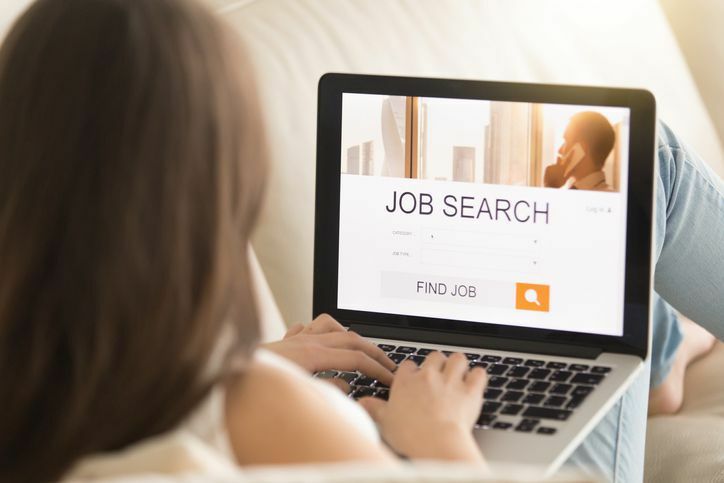 Use this valuable list of nine different online job-scouting websites to easily find the jobs you want, connect with decision-makers, submit your resume, and more! On Indeed, you’ll find more job listings than you need from thousands of company career pages, newspaper classifieds, job boards, and other online sources. This platform encourages you to create an account that will store your information and resume, so you can save time on bulk job applications. It’s also super easy to use; just type in the job title, keyword, or company you are interested in and Indeed will give you a list of job postings in your area to apply to. If you are not already on LinkedIn, set aside an hour or two to create an account and fully optimize your profile. Upload a professional profile picture, fill out all the information, and start hunting for open positions. The greatest advantage to using LinkedIn to connect with employers and apply for jobs is that there’s almost no limit to the amount of humble bragging you can put on your profile that wouldn’t fit on a standard resume. Upload portfolio pieces, create an extensive list of skills, and flaunt your entire education or employment history. CareerBuilder may be the largest online job site on the web today. With an extensive search tool, this resource makes it easy to find a job that meets your specific requirements, from your desired pay range to the level of education required. CareerBuilder also offers a range of tools and resources to assist you in finding a job, creating a resume, and beyond. Monster is one of the original job posting websites and has since become a global job site that gathers millions of listings from all over the world. When you use Monster, you’ll have access to an abundance of career resources, including their career advice library that you can browse by searching for the advice you’re looking for by typing it into the search bar. If you want a job in science, technology, engineering, or math, then Dice is the website for you. Dice is a niche job site, which means it provides job listings specifically for the tech job hunters. You can search for open positions by title, keyword, and location. In addition to uploading your resume and applying for jobs online, you can also explore career paths, investigate salaries, and take advantage of some tech-specific career advice. SimplyHired will help you discover jobs that are in your preferred location and match your ideal criteria for your next workplace. You can filter job listings by details that matter most to you, such as a company’s level of diversity, eco-friendly practices, and more. This job site also offers additional tools, like a salary estimator. ZipRecruiter is an exceptional job search platform with over 8 million jobs listings. Create an account, fill out some information, and upload your resume for quick and easy bulk applications. ZipRecruiter will save all of your information so you can login and apply to a few jobs in a matter of minutes. This job site also provides email alerts when there’s progress in your application process, like when your application has been viewed. Even if you don’t use Glassdoor during your job hunt, you should definitely use it to investigate the jobs you’re considering. This helpful job site does so much more than provide job listings. Glassdoor is a career community that provides user-generated content, so you know exactly what to expect from the job you want to apply to. Past or current employees share their personal experiences working for different companies, including details such as average pay rates. Snagajob is another great online job hunting site that will give you access to thousands of job listings from well-known companies and corporations like McDonald's, Home Depot, Cracker Barrel, etc. They also provide job tips to help you on your way. We wish you the very best of luck on your job hunt and encourage you to keep at your schooling as you embark on this new endeavor. To get ahead in your new career path, take full advantage of the degree programs online at Independence University—request more information to get started!